← Trekking to Advice: What my younger self needed to know. The question was posed to me, What’s My Favorite Fall Recipe? As I thought about my all the foods I love in fall, there was one common item: Pumpkin. Not pumpkin spiced. Not pumpkin flavored. Food with real actual pumpkin that’s baked, stewed, or souped. As some of you may now, I’m not one for canned ingredients, especially when its in-season. Sure, a whole pumpkin can be a bit daunting when your goal is food, and not a jack 0’lantern. 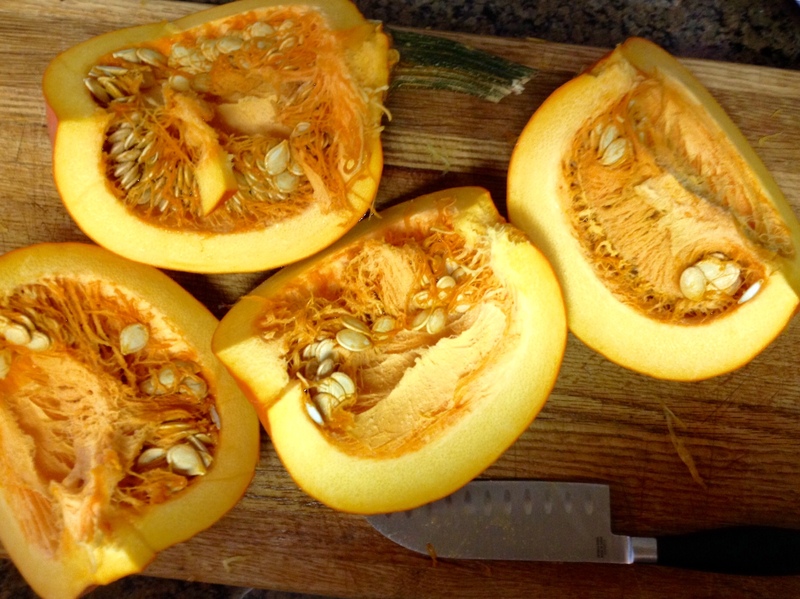 But breaking down a few small Sugar Pie pumpkins into the perfect ingredient for pies, cakes, soups, and stews in under an hour. 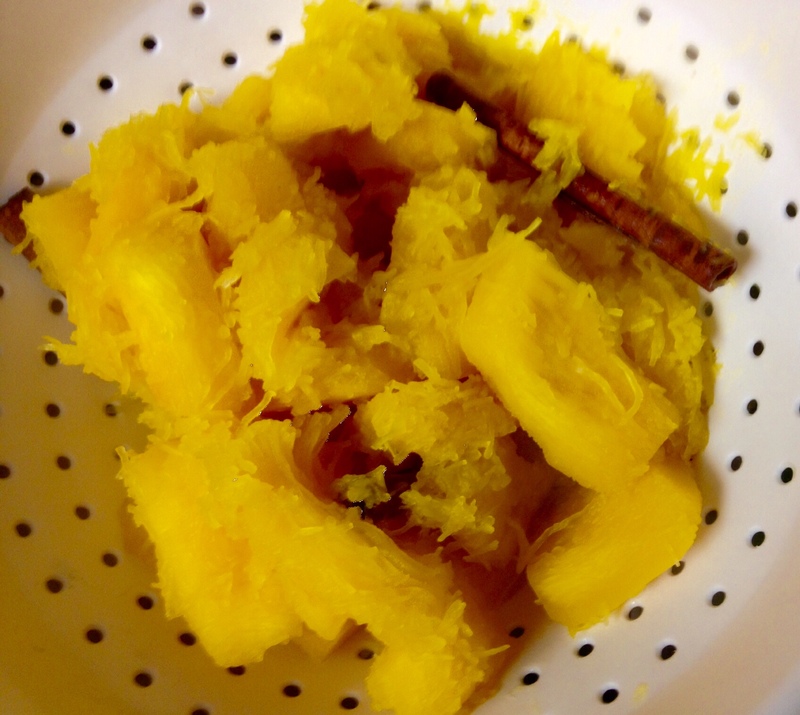 Here are simple steps to give your fall recipes the freshest taste of pumpkin. First, start with the right pumpkin. The best one is the Baby Pam Sugar Pie Pumpkin. Sugar Pies are the modern baking pumpkin. The skin is very thin, the flesh is sweeter, and you should be able to find it at your local farmer’s market or most grocery stores (Trader Joe’s, Harries Teeter and Whole Foods have them). Cut the pumpkin into quarters. Remove all the seeds and save for later. 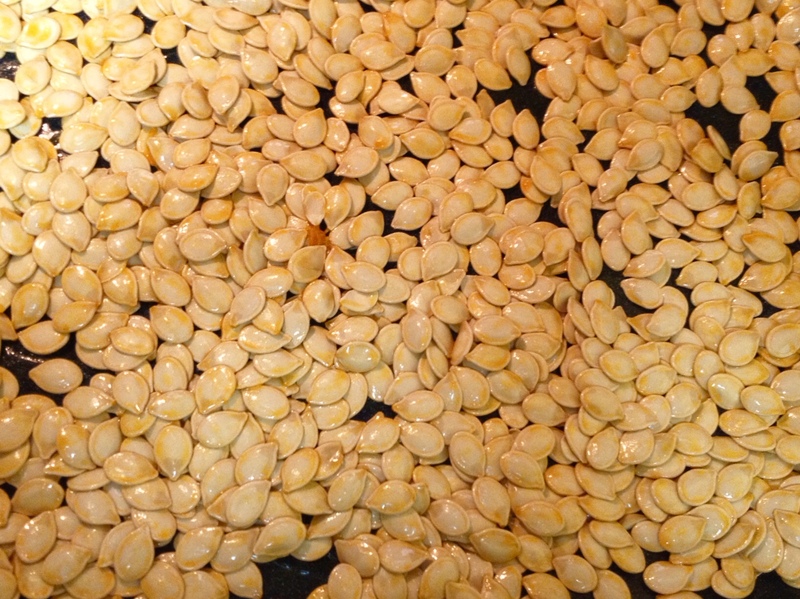 Pumpkin seeds are fantastic roasted with different seasonings and spices. 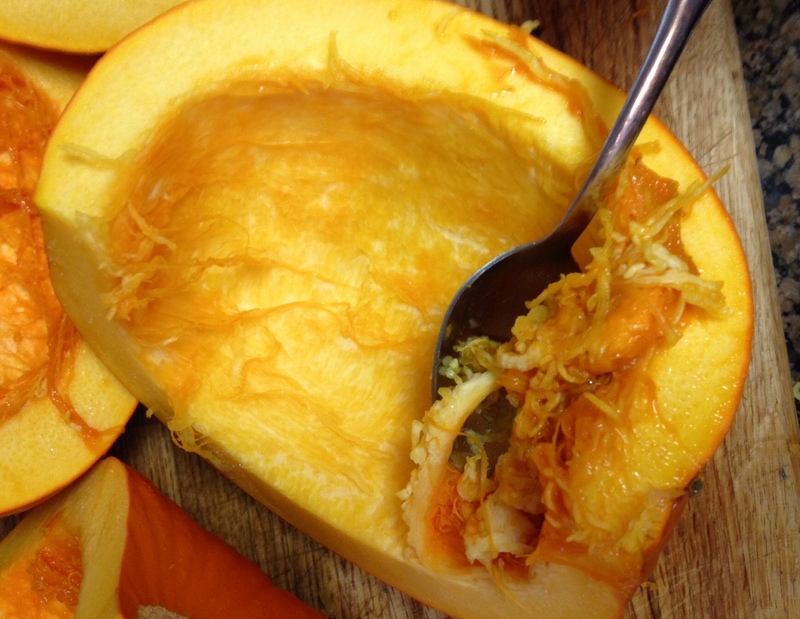 Remove the pumpkin “guts”, technically called the fibrous strands, by scraping them out with a metal spoon. Throw the guts away. Next will be the most difficult part. To remove the tough, outer skin, use a common potato peeler across the ribs. 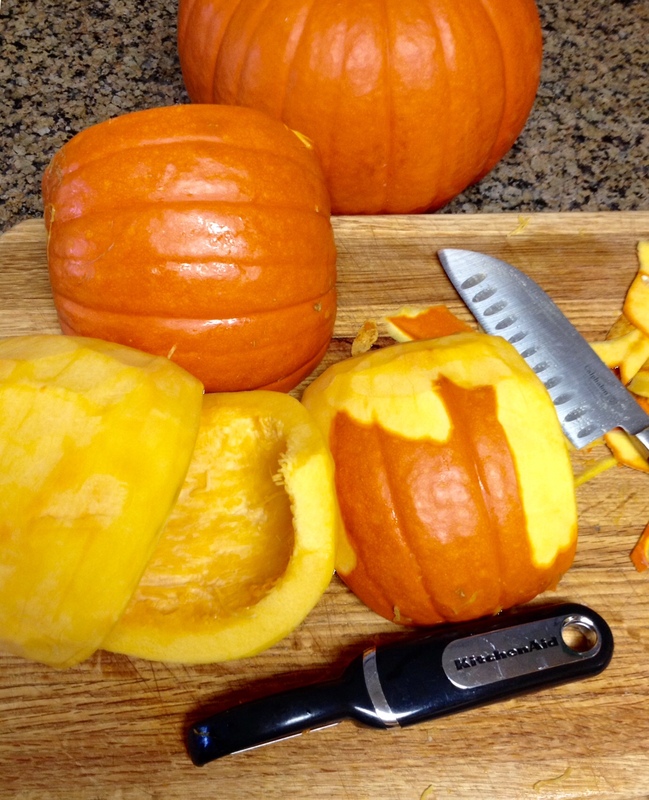 You may need to cut the pumpkin into small pieces to more easily get to each section. 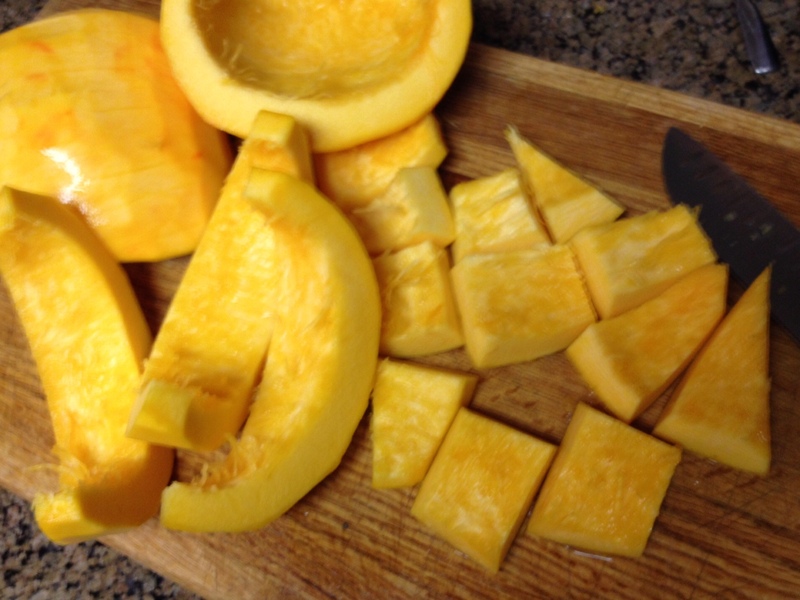 Cut the cleaned pumpkin into small chunks, about 2 x 2 inches each. Place all the pumpkin into a large part. Add a few cinnamon sticks and 2 inches of water. Heat on medium-high heat, periodically stirring. 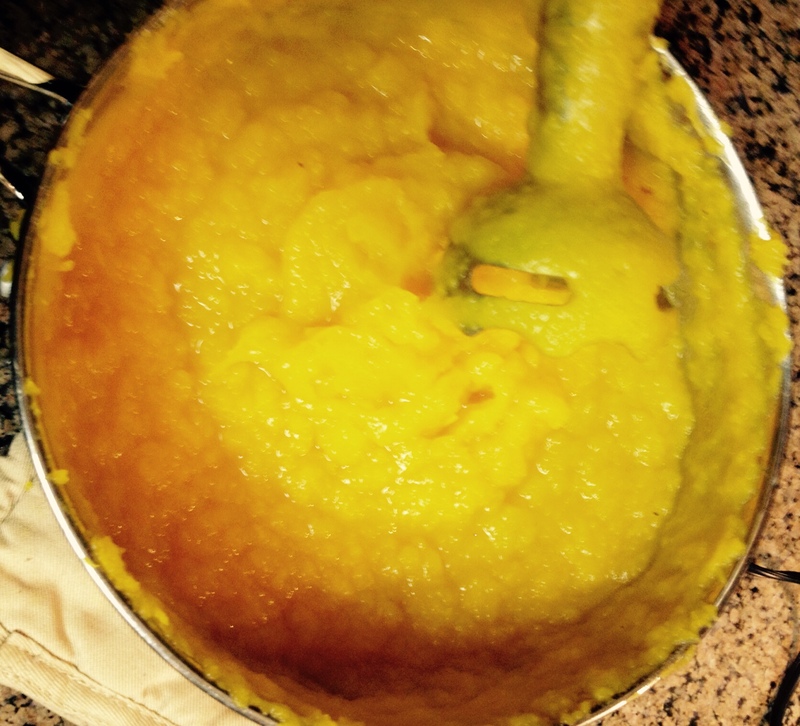 You may need to do this in a few batches if the pot is not big enough. 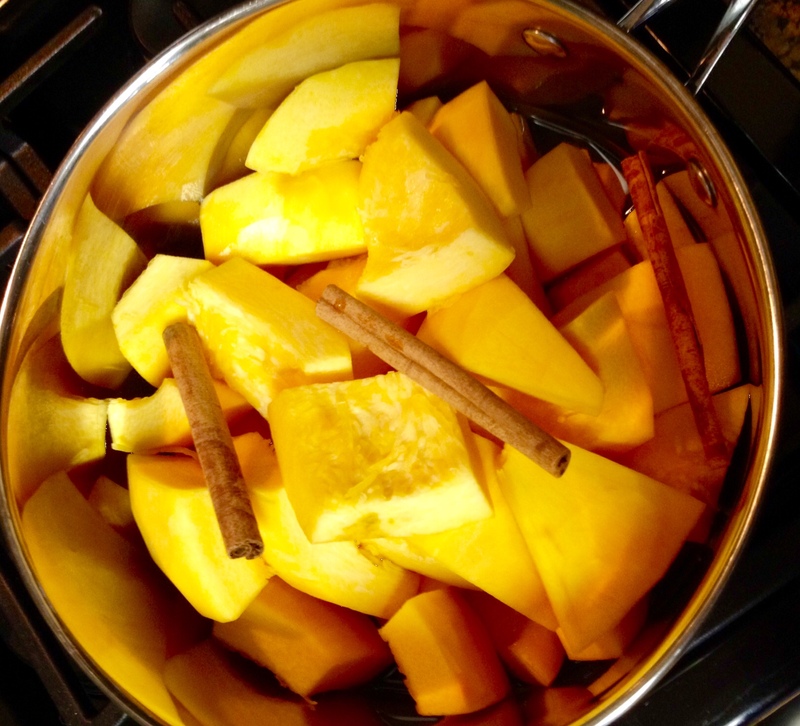 Once the pumpkin is soft and mushy (about 10 -15 min), take off from the heat, drain the water, and remove the cinnamon sticks. 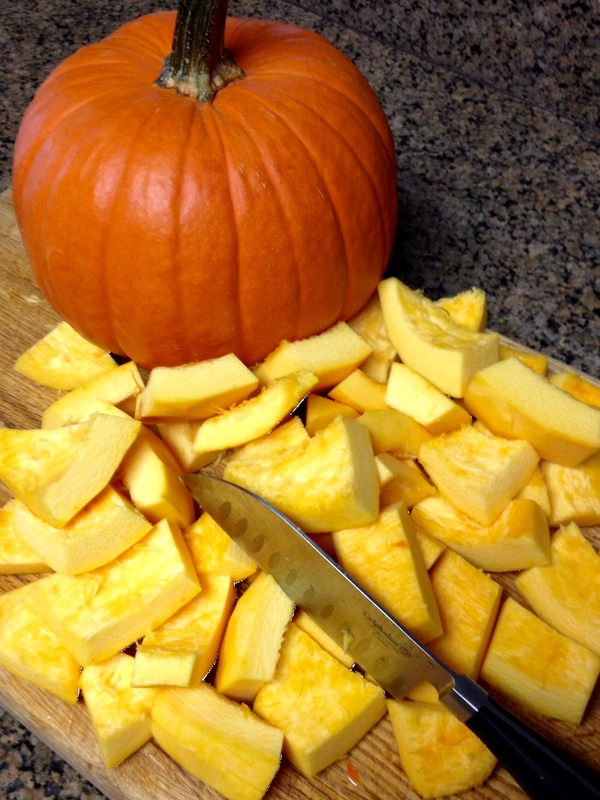 Place all the pumpkin in a large bowl, or back in the cooking pot. 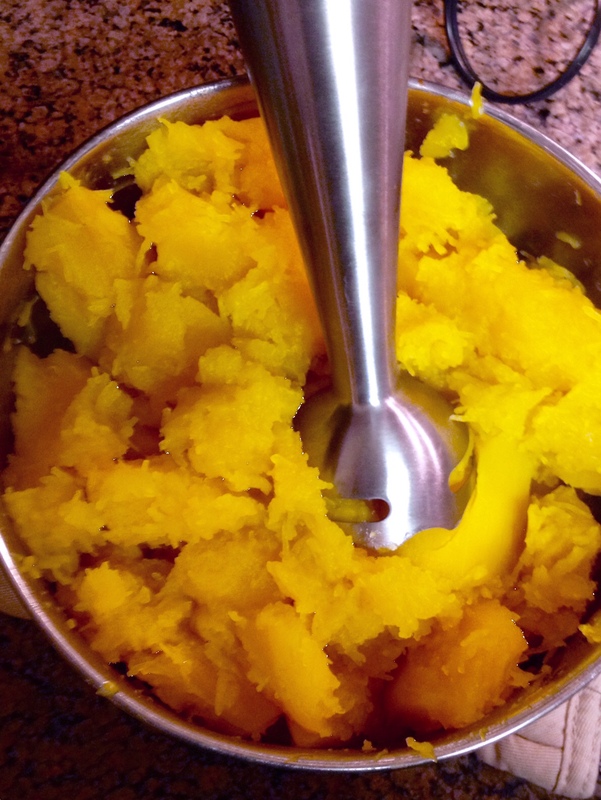 Use an immersion blenders to puree the pumpkin. If you don’t have one of these tools (which I highly recommend owning), you can also put some muscle into a potato masher or ricer. 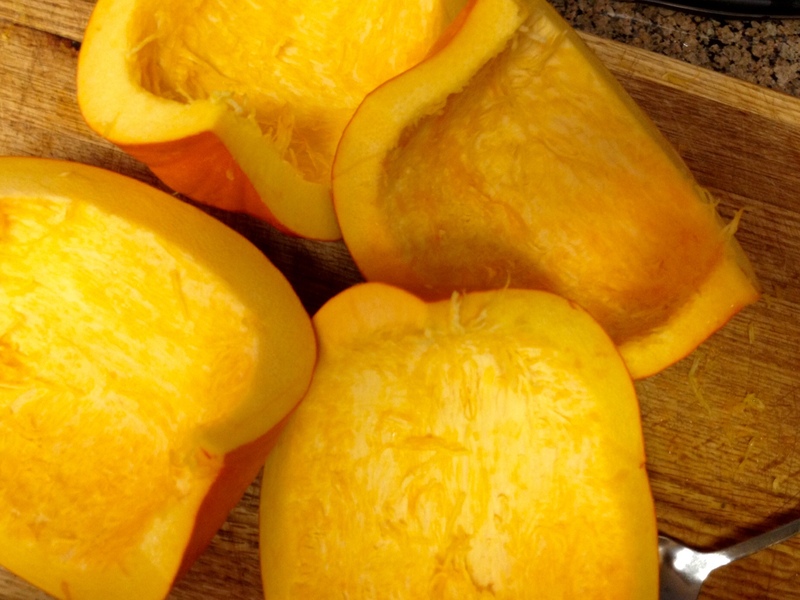 Please share with me the recipes you’ll be using with Fresh Pumpkin! This entry was posted in Fall/Autumn, Kitchen Tips, Uncategorized and tagged autumn, Blogtober, comfort food, kitchen tips, Oktoberfest, pumpkins, The DC Ladies. Bookmark the permalink. Glad you enjoyed the mini pumpkin tutorial. Please let me know what you end up cooking! Turned out good, but would have been interesting to make this with fresh pumpkin!! Thanks for sharing! That’s a great looking recipe.